The usual design in most offices is that each employees are isolated in their own private space or cubicles. In LegalMatch, we tear down barriers and walls. 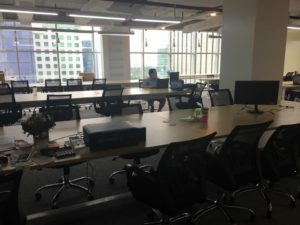 We have one huge open space that is our common workspace. Long tables are strategically placed so that one team can sit on both sides while working. One table represents one team. All the chairs are the same for everyone regardless of position. 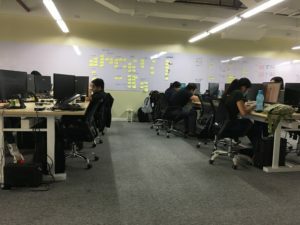 On the walls are whiteboards where each team can freely post their discussions, work project status and progress, reminders, and anything relevant to the project development. 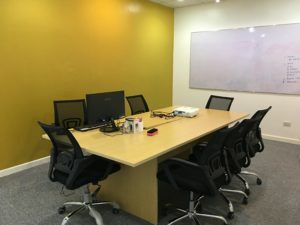 We have two enclosed conference rooms we call the Blue Room and the Yellow Room. Both are sound proof so the teams can hold their respective meetings in private and without disrupting others. Previously, while LegalMatch was still renting seats at The Tide, the work tables function as conference room tables too. In our own office, we feel the need of these conference rooms for planning, retrospective, and other team meetings. It supports agile. It promotes better communication. 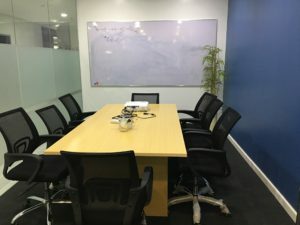 This also encourages easy collaboration among colleagues and as a result, it enhances the flow of information, speeds up work completion, and creativity and productivity are given a boost. Employees have the sense of belongingness. We feel we are part of a bigger team task rather than just our own individual tasks/duties. Taking into consideration design and practicality, our office looks industrial and modern. It is very lean as we tried to do away with anything exorbitant and unreasonably inessential. 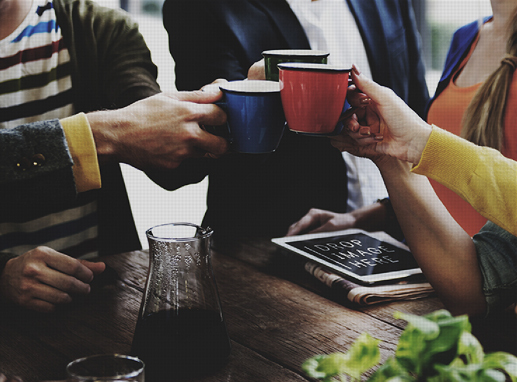 We employees develop a stronger bond as we feel we can easily approach each other anytime. We interact with each other on a regular basis and interactions are more frequent and informal. The constant intermingling generates a sense of camaraderie. I know you are thinking that a setup like this may tend to get noisy that may affect employees’ focus. Another issue could be the lack of privacy which may be intrusive and stressful. In LegaLMatch, the number of employees is manageable enough not to spring workplace chaos. Aside from the size, the maturity level of the group matters the most. The LegalMatch workforce is composed of mature and very disciplined individuals who are very much empowered, dedicated, and driven. Each knows the balance between knowing his/her own boundaries and upholding easy collaboration for faster information flow.